This is not Hyperion’s first foray into Stenhammar territory. Fairly recently the label issued Martin Sturfält’s collection of the solo piano music headlining the two piano sonatas alongside the Sensommarnätter and the Three Fantasies (CDA67689). 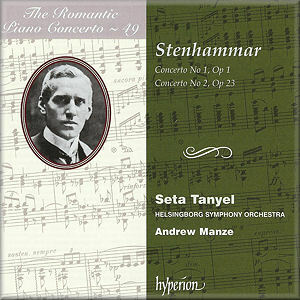 Stenhammar’s two piano concertos in character have their counterparts in Brahms’s two piano concertos. The difference is that Stenhammar 1 has the majesty and Olympian loftiness of Brahms 2 while Stenhammar 2 has the craggy passion of Brahms 1. Another work paralleling Stenhammar 1 - which is hear heard in the original orchestration as discovered in the Library of Congress in 1983 - is Tchaikovsky’s Second Piano Concerto - regal celebration with a poignant emotional cargo. Neither work is a complete stranger to the recording studio although this is, I think, the first time that the two works performed by the same pianist and orchestra have shared the same separately available disc. They do in fact occupy disc 3 of the wonderful Bis box of Stenhammar orchestral works (BIS-CD-714/716). There they appear in fine performances by Love Derwinger (piano) (No. 1) and Cristina Ortiz (piano) (No. 2). The mighty First Concerto is on Chandos CHAN 9074 with Mats Widlund as pianist. The Second Concerto has been around in recorded form for a few years now. EMI Classics’ Matrix series included it on CDM 5 65081 2 in a version by Westerberg Stig with the Munchner Philharmonic conducted by Janos Solyom (b. 1938). The EMI CD has been long deleted. The epic First straddles the worlds of the Grieg Piano Concerto and Brahms Second making imposing demands on soloist and orchestra. It’s strong and sturdy with some inspirational writing in line with the Stanford Second Concerto. It ends audaciously with a sustained poetic downbeat in which we ehar what amounts to a contemplation on one of Stenhammar’s Runerberg songs: Lutad mot Gärdet. There’s no rhetorical flourish but a satiated downward curve into sleep. Ortiz on Bis is a splendid advocate for the First as Derwinger is for the Second However Tanyel has excellent recorded sound, the coupling is cogent and Tanyel can be heard without three other discs of orchestral Stenhammar; not that hearing the other works is a hardship. Widlund on Chandos is excellent in No. 1 as Solyom is in No. 2. Solyom gives the most passionate performance. However EMI cut the Stenhammar ‘cake’ in a different way. That disc, if you find it somewhere, adds the cantata Florez och Blanzeflor and the Westerberg version of the Serenade - all dictated by the exigencies of the EMI catalogue. The useful notes for the Hyperion disc are by the conductor Andrew Manze. Two leonine concertos of the Scandinavian romantic persuasion ready not merely to enchant but also to impress with their epic mien. They stand as companions for the first time on a single freestanding disc. A logical choice in performances of total engagement.